BU has received a commitment for 2020 from St. John’s Prep right wing Brian Carrabes. 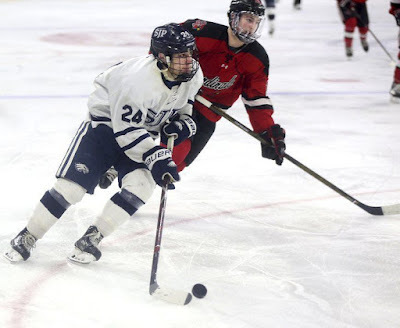 As a sophomore, the 5’10”, 175 pound North Andover native paced the Eagles in scoring with 34 points and in goal-scoring with 21 in 23 games, leading SJP into the Massachusetts (MIAA) Super Eight tournament. Carrabes will transfer to Kimball Union Academy this fall, after being courted by several “elite prep teams,” reports New England Hockey Journal’s Jeff Cox. Carrabes gave the Terriers his verbal following strong showings at the BU Hockey Prep/HS Showcase and USA Hockey’s Select 15 Development Camp. NEHJ had ranked him the top 2001 in the MIAA. "Brian's a naturally gifted player who knows what to do with the puck on his stick. When he has energy and uses that speed, he's a great player." 01 F Brian Carrabes @TerrierHockey was a difference maker for @SJP_Hockey during #Super8. His speed was dynamic in the MIAA: great acceleration & attacker's mindset. Plays the body hard & fires up the bench. Shot has improved in strength, quickness & accuracy. Will attend KUA. Brian Carrabes to the Terriers. 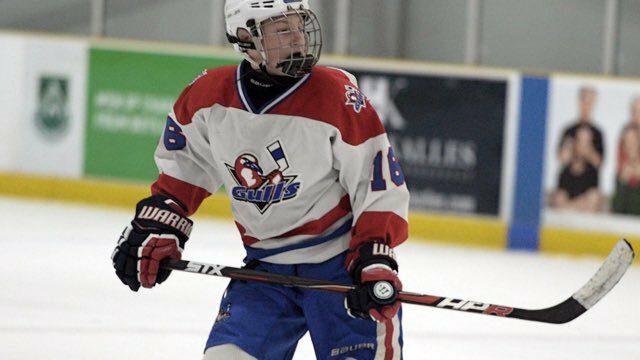 3.5⭐️ has an explosive first step and can weave his way to the net. Rolls off contact. Breaks down defenders and can handle it at top speed. Impacted every game at the HS level. Will move to KUA this fall. Carrabes is the fourth forward in BU's 2020 recruit class, joining NTDP U17s Dylan Peterson and Luke Tuch, and St. Sebastian's Liam Connors. Six future Terriers named to the 42-man All-American Prospects Game roster, including four of the 14 defensemen. F: Trevor Zegras, Robert Mastrosimone. D: Alex Vlasic, Case McCarthy, Brendan Doyle, Cade Webber. All but Doyle and Webber are 2019 recruits. This year’s game is in Minnesota on Sept. 19. "Wilmer is on the smaller side, but he’s really slick. He can skate well and he does a terrific job finding open teammates for scoring chances. He’s exceptional in small areas and isn’t afraid to use his quickness to win battles for loose pucks. His hands and playmaking ability were extremely impressive in this camp. He’s similar to current BU left wing Patrick Harper." Last season, Wilmer scored a league-best 73 points for the Long Island Gulls Bantam Majors, as well as 48 points in 17 games as a freshman at The Portledge School. The 17th Travis Roy Foundation Wiffle Ball Tournament in Essex, Vt., raised $617,634. Among the 32 teams that participated in the games at Little Fenway, Little Wrigley and Little Field of Dreams was a group of Terrier alums that included Jack Eichel, Matt Grzelcyk and Charlie McAvoy. ● Boston Herald Wiffle Ball Tourney a rousing success for Travis Roy . The Travis Roy Foundation also will benefit from the 4th annual Common Avenue Charity Classic, matching BU and BC alums. It’s set for Friday, Aug. 24, at Walter Brown Arena. Rosters and ticket information. PLAYER SIGNING - Nikolas Olsson comes to the Thunder after four years at Boston University!